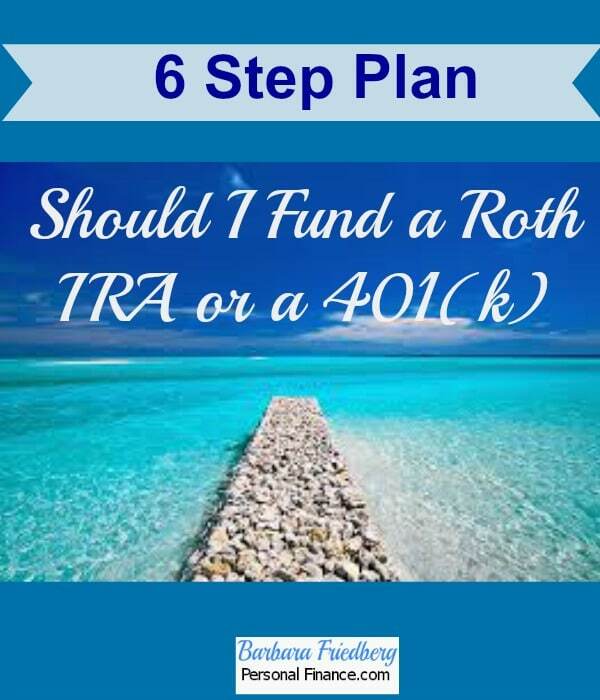 Should I Contribute to a Roth IRA or a 401(k)? Should I Contribute to a Roth IRA or a 401(k), if I Can’t Fund Both? This is a common question for those just starting out. A 20-something, in her first job is automatically enrolled in her workplace 401(k) program. That’s a good thing, since it gets her money working and growing for the future! But, wait a minute, is the company 401(k) the best choice for the new worker? Look at all the angles when deciding whether to contribute to a Roth IRA or a 401(k). If there is an employer match, always fund a 401(K) account first. That’s because if the employer chips in a 5% or 6% match to your investment then you are getting free money. If you make $50,000, then 5% is $2,500. Under any circumstances, would you turn your back on an extra $2,500 per year? Of course not. And that is why, if the company chips in 5% of your salary annually to fund your 401(k), your answer is, “Yes, I’m all in”, at least until you get the company match. Now that we’ve covered the matching contribution angle, here’s the next part. 2. Are you disciplined enough to contribute regularly to a Roth IRA? The most important part of retirement savings is getting started and keeping at it. If you’re confident that you’ll set up an auto debit from your paycheck into a discount investment brokerage account, and then choose the best investments for retirement. Now, you can continue with the discussion of whether to fund a Roth IRA or 401(k). If you don’t think you will contribute to the Roth, then stick with the 401(k). There are pros and cons to both alternatives. And the good part is that in most cases, you may choose to fund both a Roth IRA and a 401(k). You can ultimately contribute a greater amount to a 401(k) than to a Roth IRA. The upper limit to contributing to a 401(k) in 2015 is $18,000. If you’re reading this after 2015, check IRS.gov for current contribution limits. So, if you can’t afford to kick in much this year, as your salary increases, you can bump up your 401(k) contributions. Those over age 50 can contribute an additional $6,000. Caroline is 30 years old and this year she contributes $6,000 to her 401(k). If her investment grows at 7.5% annually, then her $6,000 contribution will be worth $93,685 at age 68. This example shows how just one year’s contribution can make money on top of the initial investment. Think about how much she’ll have in retirement if she continues to contribute and increase her retirement savings every year. So far, the conversation assumes that the 401(k) investment choices are equivalent to those in your Roth IRA. But what if your 401(k) charges high fees and lacks the low cost index funds you prefer? 4. What to do with poor investment choices in your workplace 401(k)? Even if the 401(k) lacks the best low cost index funds, you still should invest up to the amount where you receive the free money employer match. After that point, invest your remaining retirement dollars in a Roth IRA at a discount broker such as Schwab, Fidelity, TD Ameritrade etc. You can choose low cost index funds and keep your fees at rock bottom. 5. How much can you contribute to the Roth IRA each year? With an IRA this year, you can save up to $5,500, or $6,500 if you’re 50 or older. If you’re single and earn over $116,000 or married (filing jointly) and earning over $183,000 you can contribute the full amount. If you earn more, you’re full contribution is phased out. But, if you’re earning that much money, this particular question of whether to contribute to a Roth IRA or a 401(k), shouldn’t apply. You should invest in both a 401(k) and a Roth IRA up to the full amount allowed by law. 6. Why our family contributes to both the Roth IRA and the workplace 401(k). We get an employer match, so of course we contribute to the workplace 401(k). The Roth IRA has some very important benefits. First, keep in mind, it’s a retirement savings vehicle. So, in most cases, assume that you’ll keep your money invested until you can withdraw it tax free at age 59 ½. You need to be aware that there’s a 10% penalty for early withdrawals*. Unlike a traditional IRA, with the Roth IRA you have no minimum distribution requirements at age 70 ½. In fact, your heirs can inherit the Roth IRA, allowing the money invested to grow and compound tax free for a very long time. *A bonus for Roth IRA investors are the caveats which allow you to use the money for to pay for college, medical expenses greater than 7.5% of your adjusted gross income, a first time home purchase (up to $10,000), or the costs of an unexpected disability. In a Roth IRA, you can choose the investments, and keep fees and costs rock bottom by investing in low cost index funds. If you can’t contribute to a 401(k) and a Roth IRA, make sure to contribute at work to get the “free employer 401(k) money”. Then, if you want the easiest and most convenient alternative, stick with the 401(k) and bump up your investment with each salary increase. If you aren’t enamored with the 401(k) and you have the discipline to regularly contribute to a Roth IRA, then put the rest of your retirement savings in a self directed Roth IRA. Invest in low cost index funds, regardless of the account. Can you contribute to a Roth IRA and a conventional IRA each year? I have been investing $6500 (I’m over 50) to a conventional IRA but now think a Roth IRA makes more sense. Also, are the annual levels above which you lose your eligibility to make an annual contribution? Hi Mark, You can only contribute to one IRA per year, either a Roth or a Traditional.